I need your help – come on out to the Tennessee Valley Fair on Thursday, September 16! Jasper (shown in the photo with me to the right), is the mascot for the Tennessee Valley Fair. We met at the Dogwood Arts Festival in April. 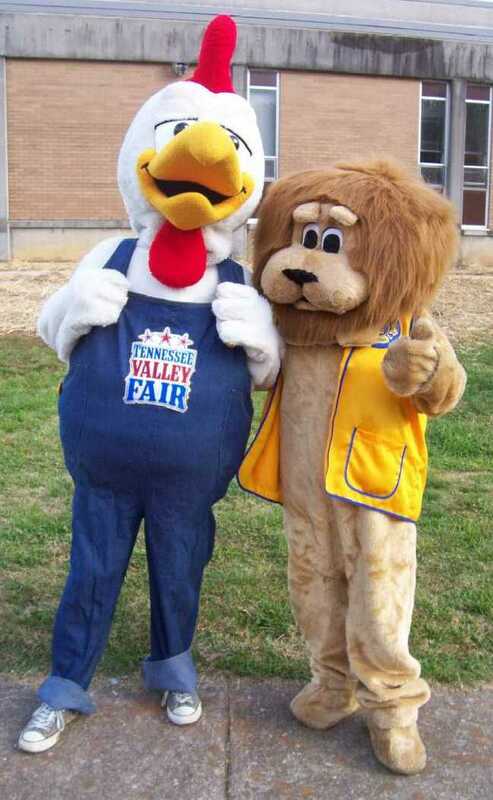 Recently, a Lion told me that Jasper was hosting a Mascot Party during the Tennessee Valley Fair. Of course, I was interested! There will be a mascot parade from the Jacob Building through the park to Jasper’s “Roost”, introductions of each mascot and their organization, a group photo, and a Dance competition. I’m not that great a dancer, but I could really use your support. Come on out to the Tennessee Valley Fair on Thursday, September 16, 2010 from 7-8 p.m. and wear your Lions gear! Thursday is also Knoxville News Sentinel Reader Appreciation Day. So, cut out the coupon from the News Sentinel and save $2 on adult admission to the Fair!